Anguilla is just north of St. Martin. Landscape: Semi-arid and flat. Lots of white, sandy beaches. Visited: We visited Anguilla with Karen & Jon Feb 11-13, 2002, and with the Harshbargers Feb 17-20, 2002. History: The British established the first permanent colony on Anguilla in 1650. Despite several futile attempts from the French, it has stayed under British control ever since. While arid conditions prevented large plantations, the island did become an exporter of tobacco, cotton, and salt. The difficult conditions for crops remained, however, and in the early 1800’s, the population began to drop from a peak of about 10,500, and the island slowly slipped into a decline, largely forgotten by the rest of the world. In 1967, Britain tried to lump Anguilla with St. Kitts and Nevis, the nearest British dependencies. The purpose was to create a new Caribbean nation, the Associated State of St. Kitts--Nevis--Anguilla, with Britain still controlling foreign affairs and defense. Anguillians wanted nothing to do with this new state, seeing it as subjugation to the more powerful (and fairly distant) St. Kitts. Within a month, the Anguillians had armed themselves and revolted, forcing the St. Kitts police off the island and blocking the runway against a reinvasion of St. Kitts forces. A small group of Anguillans (and 2 American mercenaries) even attempted to invade St. Kitts. This was a complete fiasco, resulting in a rather large hole in the ground and a brief shootout, but no casualties. After that, nobody in St. Kitts really wanted to mess with the Anguillans. The British eventually stationed Royal Marines in the waters off Anguilla. After two years of failed attempts to negotiate a solution, the British, believing that the island had been taken over by the mafia, invaded Anguilla in 1969. They were met by goats and curious children. The Anguillans didn’t resist, content that some resolution was in the making. The Anguillians eventually got their way, when Britain agreed to drop the idea of Anguillian union with St. Kitts and to continue British administration of the island according to a modified colonial status that granted Anguilla a heightened degree of home rule. Incidentally, throughout the entire two-year rebellion, there were no fatalities. (Jon) We've always liked the unspoiled beauty of Anguilla. 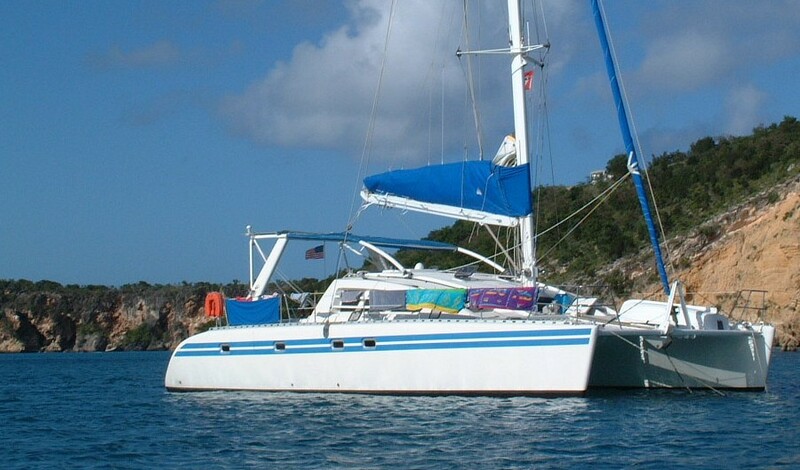 In the mid-80's Sue and I ran a day-charter boat from the French side of St. Martin to Sandy Island, off Anguilla. Sandy Island is the epitome of what you might think of as a desert island: about 1-2 acres, a couple dozen palm trees (unfortunately, removed by the last hurricane), and a coral reef that completely encircles the island, making it into a huge swimming pool. Oh, and a small shack that sometimes functions as a bar/restaurant, with a handful of covered tables. There are extensive reefs off the entire western side of Anguilla, and long beaches of the finest sand you can imagine. There are now a few hotels, but most of Anguilla is still as it was in 1980, with lots of fishermen and little other commercial activity. Walking through the 'town' was delightfully relaxing, with folks greeting us from their front porches as we walked by. (Amanda, age 12) Anguilla is a lot different from St. Martin. First of all, everything seems so flat. Unlike St. Martin, Anguilla is not mountainous at all. Luckily for me, at least, everyone there speaks English, Anguilla being controlled by the British. 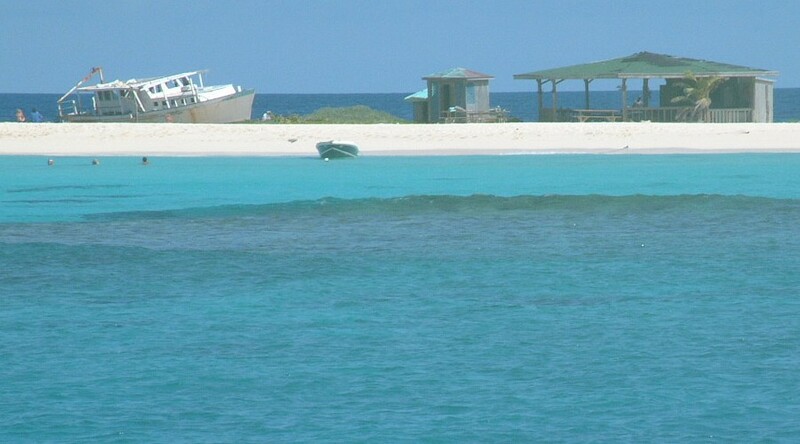 I didn't go ashore much there, but Sandy Island and the Prickly Pear Cays were beautiful, onshore (not Sandy Island... it's only sand) and underwater (the snorkeling was great!). We only spent a day or two there, and we didn't rent a car or go exploring by bus, so I don't know a lot about the main island. The view from our Crocus Bay anchorage. in the ... tiny building just left of center. (Chris, age 15) Anguilla struck me as a very dry and somewhat boring little desert-like island. It has one road, going from one end to the other and not much else. True, we didn't explore much of the island, but it is so plain I doubt we would have seen much else if we did. The shoreline was a nice, with long sandy beaches, but the homes were little more than shacks [see note below] and there were hardly any bikes, let alone cars. It seemed like hardly anything would ever happen there. The water around Anguilla is a different story altogether. 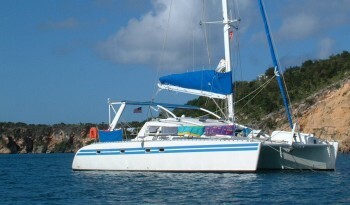 Anguilla has beautiful reefs, and the best snorkeling I have seen north of Guadeloupe. While the islands seemed dry, hot, and tired, the oceans were teeming with life. I saw huge reefs, turtle, lobster, and MANY kinds of fish! (Sue) Well, unlike some family members I really like the quietness of Anguilla, and the fact that not much happens there, but I guess that's the difference between my age and teen-age. I think the beaches are beautiful, and the little homes are very picturesque, painted in rainbow colors with fancy woodwork. It has some of the clearest water of the region, but it was sad to see all the damage to the coral reefs done by the last few hurricanes. "I read many of the "Hacking family" stories of islands that you have visited. On the Anguilla site someone mentioned that the island had mostly shacks. How misleading? Indigenous Anguillians own some of the best and most modern homes anywhere in the Caribbean. Most homes are built of concrete, have electricity and running water, as well as many other modern amenities. Besides, the standard of living in Anguilla is the best in the Eastern Caribbean. I would dare anyone to show me a "shack" in Anguilla. I am proud to be of Anguillian descent."